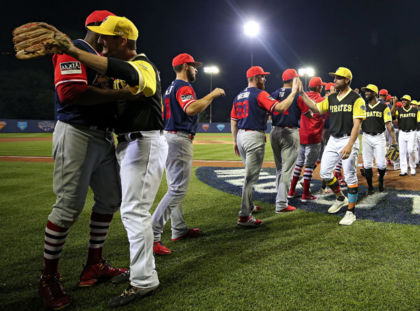 It's hard to dispute the juvenile joy of MLB's Little League Classic. Just try explaining MLB’s latest gimmick without stammering, backtracking, or taking 20 minutes. It was the Little League Classic. Can you call a first-time annual event Classic? See, this is what happens. Too many damn questions. The answer involves going to a remote town in central Pennsylvania where elite Little Leaguers play to see Big Leaguers compete on a somewhat neutral ground. The crowd will number less than 2,800, holding free tickets, with no beer sales, and the game is broadcast live on national cable television. It’s a game that counts in the standings, with both MLB clubs involved in the NL Central pennant race. 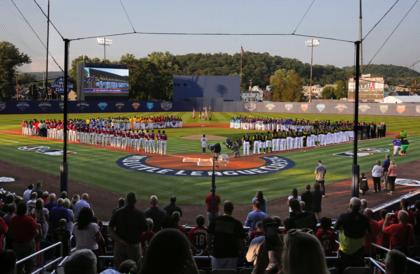 The Little League Classic was not played on a Little League field as the name suggests, but instead on a Class A minor league diamond in Williamsport, PA, the longtime hometown of the Little League World Series. This was the fourth game of a weekend series between the Pirates and Cardinals. St. Louis won Thursday and Friday. The Pirates prevailed on Saturday night, then both teams flew 20 minutes east to Williamsport to glad-hand the international youngsters of the Little League World Series tournament and bake in the Sunday afternoon sun at Lamade Stadium. It was fun to see hatless Cardinals players sweating in the awkward jersey-and-jeans combo in the stands before having to fulfill the contractual obligation that is the ESPN Sunday Night Baseball game. With important late August games ahead, here they were barnstorming in the local minor league facility (home to the Phillies Class A Williamsport Crosscutters) for a distracted crowd made up of Little Leaguers and their families. This was after a rain-delayed Saturday contest at PNC Park, so bullpens and patience were already stretched thin. It’s amazing how MLB continues to strive for a Medicine Show mentality for teams playing 162 regular season games on a set schedule with an enormous October postseason slate as well. But MLB insists on trying to sell its own fetid brand of snake oil by overloading the site-specific gimmickry. The upcoming “Player’s Weekend” where teams wear softball style uniforms with forced nicknames on the back is a great example. Do you think the esteemed Yankees and their pinstripes wanted to surrender to this playground mentality for even a second? And why should they? So MLB can sell more shirts and hats based on the forced frivolity of the occasion? Some players don’t have zany nicknames, sorry, and they don’t eat cereal for dinner or enjoy avocado toast at all hours. 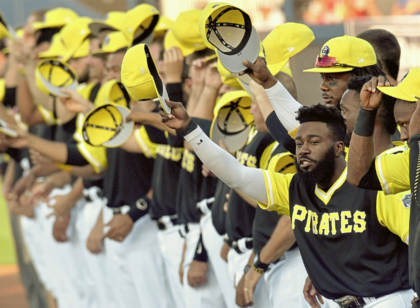 The “Player’s Weekend” cap sells for $33, and my team, the Pirates, are wearing a hideous banana yellow number that looks like something you’d see on an airport tarmac. Leave it to me to attend the MLB Little League Classic, which was like boarding a ghost ship in a baseball Sargasso, with jagged rocks of child athlete exploitation dangerously close to the hull. There was no official “sponsor” (Taco Bell, Geico, Viagra? ), no souvenir programs printed, no price on the tickets. It was a greed surrender of sorts, in the name of youthful purity that is ESPN’s Little League World Series gambit. They need ratings and MLB needs youth appeal, so it was the perfect match. Too bad nobody knew it was happening other than the braggarts at ESPN’s media department and the lowlife memorabilia collectors hungry for the somewhat underwhelming selection of “first” Little League Classic ephemera. Hell, I had to “mansplain” this whole Williamsport shebang to half a dozen curious women in the Ohio branch of my family. 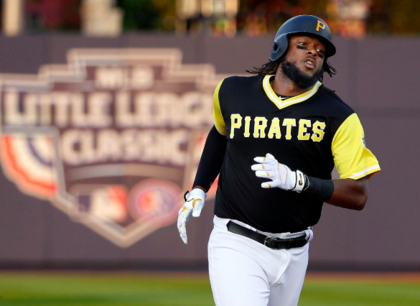 Players from both MLB teams said all the right things as they went through the motions last Sunday night in the middle of Pennsylvania. Kids and pro ballplayers will always be a winning Norman Rockwell image. 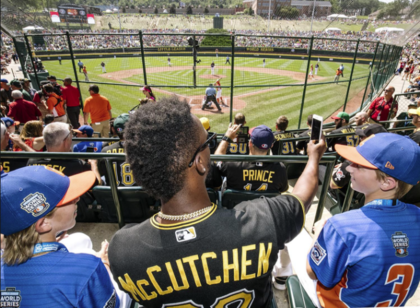 The dark cloud of inconvenience surrounding the Little League Classic melted away with images of Andrew McCutchen and Josh Bell spending fun time with the Little Leaguers. I tried to get tickets online for weeks but there was radio silence on all fronts, including the hyperactive souk known as Craigslist. Not to be deterred, I went to Williamsport anyway, having booked a hotel room there back in April when MLB quietly announced their latest crappy idea to move teams around like infomercial shills. Hey, the Bucs won and I was happy and so were most of the people who got inside the tiny minor league park on a pleasant Sunday evening. It was kind of cool to see the international groups of Little League World Series participants sitting together in their uniforms. The Australian team was particularly boisterous, especially as they mixed with dowagers from Greenwich, CT, and other cousin-of-the-assistant GM dandies. They were a lanyard-wearing army with that smug air of knowing tickets were so scarce that no one knew what they looked like until minutes before the game. 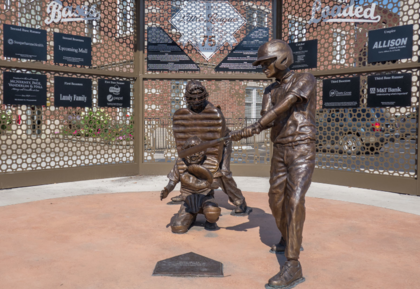 Here’s a chronological rundown of my trip to Williamsport made with my savvy 12-year-old daughter Roxanne who’s up for this type of adventure. Hey kid, wanna go to Lycoming County, PA, with no hope for tickets to an unwatchable game in the second-oldest minor league ballpark? Sure, dad! After some family business in Ohio, we’d been in Pittsburgh to see the Saturday game against these same Cardinals. We approached from the west as Williamsport was on our way home to the Hudson Valley, so it all made sense. After this Cardinals travel madness, the Pirates were set to host the peaking-too-soon juggernaut Los Angeles Dodgers for a four-gamer back in Pittsburgh. As far as I know, that series was to be gimmick-free and would surely doom the Pirates effort to stay relevant in the NL Central race. But let’s not get ahead of ourselves. Perky waitress has never heard of the Little League Classic. Little League World Series game between California team and South Carolina team is on one of 27 televisions around the joint. California catcher leaves game with agonizing Achilles injury off a foul ball. Satellite radio coverage of Yankees vs Red Sox marred by Joe Castiglione’s annoying complaints about how long Sonny Gray takes between pitches. Sunshine making electronic sign advisories regarding Little League World Series traffic unreadable. No worries, Roxanne bought a miniature Buddha in the Strip District in Pittsburgh so we're all good. Switched radio to Sirius XM The Joint, listening to excellent dancehall selections as we pass Mill Hall, PA. Enough Joe Castiglione already. Very high number of cars up for sale and parked solo on the side of the road. Doesn’t seem to be many takers. Or people in general. 4:50 p.m. Checking into Holiday Inn on Pine St.
Front desk guy says tickets are “impossible to get” and he wishes he wasn’t working so he could at least check out a public screening of the game somewhere. Warns me not to walk to BB&T Ballpark (Bowman Field). "It looks close, but it really is kind of far," he says. Fearing heavy traffic and parking issues, Roxanne and I begin a Bataan-style walk to the ballpark. We pass Victorian homes with giant porches, “Millionaire’s Row,” a cinema, and several churches. All seemingly abandoned as if sketched out by Rod Serling. The only human we see for eight blocks is a Papa John’s Pizza delivery woman who is counting her cash as she plods back to her Camry. She got a tip. She has no tickets for the game. Parched and foot-weary, we turn onto a pathway under the ballpark’s main entrance signage. Cops are directing traffic, which isn’t bad. Parking seems easy, too. Roxanne comes streaking past me hyperventilating. I fear a bee sting or some other injury, perhaps foot-related. She manages to express that she is injury-free as she explains who is standing behind us in the tiny group waiting near the main gate. It is YouTube sensation Alisha Marie. She gets a photo with her and is ecstatic as she sends texts to all her pals back in Rhinebeck, breathless as if Dave Parker or Ed Ott were hanging around or something. MLB media reps soon appear with full credentials for Marie and her stone-faced father, both wearing Cardinals gear. They brought them in to get the social media angle on the online preteen market. The sun is lowering strong beyond the West Branch of the Susquehanna River blasting harsh light on the generic ballpark entrance. There’s not one single outdoor concession in the main gate area. There’s a canopy with two women staffing a “will call” table that is as popular as the long-shuttered bars on Hepburn St. Roxanne is seated with her phone on a patch of grass. I have two fingers aloft as the buses pull up to the gate and release small groups of Little League parents who have no extras, of course. There is a schlubby guy from Staten Island who is organizing the ticket hopefuls. He counts five of us and greets each passing ticketholder with a buoyant but ineffective “Heeere I am!” Golf carts appear, lanyard-wearers double check on things. The Port-a-Johns on the nearby riverbank are quiet. Desperation sets in as player intros are heard over the ballpark PA. The buses are less frequent and release only a few stragglers. Staten Island guy says MLB should take care of us. Plan Bs are concocted. There is a bike trail on the third baseline above the ballpark and fans can catch a glimpse of the action from there, says a BMX guy who keeps rolling through this sad tableau. 7:25 p.m. Two die-cut tickets suddenly in hand! I noticed a father of two who’d been standing with us earlier talking to the Will Call betties. He’s froth with gratitude as the older Tina Fey-type at the table produces a white envelope and hands him three. I walk toward the table. “Got any no-shows?” I ask. “No, but I have extras,” she says, holding up the envelope. “Do you need one?” “Two, please,” I say with Roxanne beside me as I see the Staten Island guy rumbling toward us. Of course his seat is right next to mine as we dance through several rigged walkways and into section 7 of Bowman Field. I notice St. Louis pitcher Mike Leake is back to his hippy look. As Bell prepares to hit a towering home run to right center to put the Buccos ahead, the loquacious Staten Island guy says he drove here from Tottenville because he collects stadiums. This is his 69th ballpark. He can’t believe the Will Call betty gave us tickets. He manages to snag one of the free box lunches being distributed to the Little Leaguers and their parents. A local drum corps suddenly springs to life with thunderous notes beside the third base grandstand of the steel-girder ballpark, scaring half the section to death. Ivan Nova makes Kolton Wong look bad on a called third strike to get out of a jam. Cardinals manager Mike Matheny removes an ineffective Leake from the game. Now he’s free to go shoplift more designer t-shirts at the Kohl’s in downtown Williamsport (there is no Macy’s). Staten Island guy on my left elbow makes rude remark about older woman getting hug from one of the racing Pierogis who made the trip from Pittsburgh. He says he should be back home by 3 a.m. I wish he would beat the traffic and leave early. Among the millions MLB sunk into upgrading Bowman Field for this possibly one-off event was a video scoreboard in left field. Roxanne notices the player data includes “Favorite Subject in School.” Starling Marte was honest with his answer “physical education.” McCutchen said “science” and Adam Frazier lied with his “math” answer. Wearing his nickname “Nightmare” on the back of his zany jersey, Felipe Rivero takes the hill for the ninth inning. He does his usual 100-mph strikeout, rocket hit, rocket out, and long fly ball to end it as McCutchen squeezes Paul DeJong’s offering. Raise the Jolly Roger! Buccos win 6-3! Mimicking the Little Leaguers in the stands, the Bucs and Cardinals go through a handshake line that turns into a long, rambunctious trail of horseplay and somewhat genuine smiles. It was something to see and was the main “takeaway” for most of the jaded media types. The Mexican Little Leaguers seated behind the Cardinals dugout liked it so much they did a mass invasion of the dugout roof. The pundits insist this was a big hit and that the Little League Classic should be repeated. An usher type in the third base aisle tells me it probably will be back next year. “I heard it will be Mets-Phillies,” he said. The bar is a great mix of coaches, umpire types, TV production crew guys, and Little League parents. A few at the bar are commending the quality of the Bowman Field infield. As the SportsCenter highlights show a second baseman robbing someone of a hit in Anaheim or somewhere out west, the entire bar pauses to admire the play. Big or Little, that is the sheer beauty of how baseball endures and is always worth the trip.